At one time, California was the epicenter of everything cool. Hollywood, Disneyland , hot rods, and surfing were all synonymous with the Golden State. Nowadays, the news tells us that California’s golden days are over. 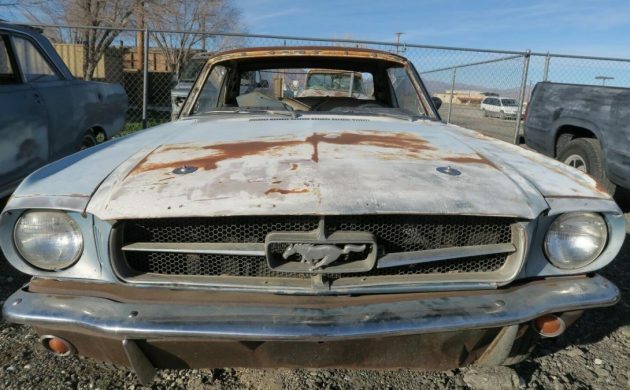 The same can be said for early Mustang coupes like this 1965 model for sale here on eBay out of Lucerne Valley, California. Produced in the hundreds of thousands, these American icons were coveted by buyers and, later, restorers for their good looks and honest simplicity. Recent trends have pointed to this love affair cooling. Prices are down for restored examples, and the cost of fixing one up from scratch hasn’t gotten any cheaper. Is the seller’s $2,995 price reasonable in this market? Does being a California car matter anymore? 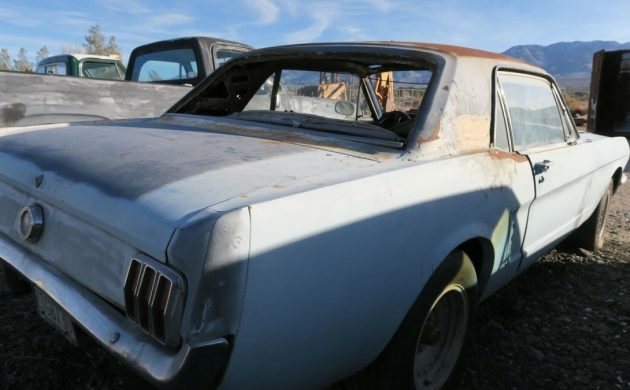 The story on this Mustang is that it has been a Southern California car its whole life. It was even built at the Ford assembly plant in Los Angeles. Finished in Wimbledon White, the car was equipped with an inline six cylinder engine and an automatic transmission. Said to run when it was parked in 1990, this pony has seen better days for sure. A close look at the first picture reveals a broken grille bar and some roughness in the front of the hood. This roughness appears to be old Bondo. 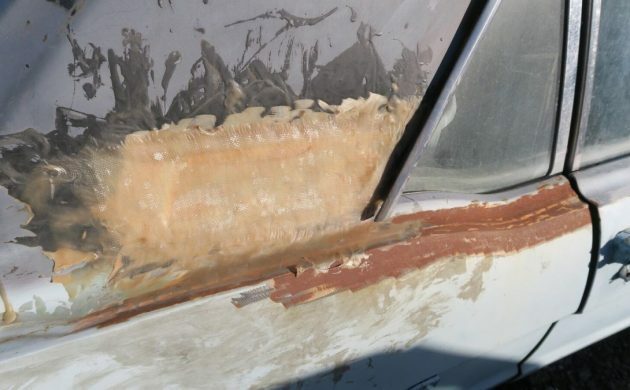 Bondo is an easy to use body filler that is good for hiding small dents and other imperfections in a car’s body. The problem is that it can hold water and is not meant for filling deep damage. Sadly, many “body men” use it for just that purpose. By the time the customer sees there is a problem, the chances of returning the car for a proper repair are long since over. Add to that another issue. The front pan is a bit dented on the driver’s side, and that section looks a bit elevated due to some sort of impact. Maybe this Mustang was in a Hollywood car chase. Continuing to look this car over, we obviously can see that the windshield and back glass are out of the car. There is also a portion of the drivers side rear roof pillar cut out for a repair that never happened. Also evident is some waviness in the drivers quarter panel behind the rear wheel. This is a known rust area for early Mustangs, so a close inspection in this area is warranted with any Mustang. One good attribute is the eighties vintage aluminum wheels. Cleaned up, they may help the new owner recover some of their purchase price on craigslist. Or, if the build isn’t to be a factory perfect restoration, they might be worth keeping. The final picture shows what would have happened to the driver’s side rear pillar if the repair had been completed. This looks to be fiberglass smothered in resin. If you were to restore this car correctly, or even if you cared about your repair lasting, then this would have to be ground out. Patch panels are available for every single piece of sheet metal on an early Mustang. While this might have been OK for the local body shop in 1990, there is no reason to cut corners like this now. That patch, and the many other signs of rust on this car, should give a buyer pause. All of it can be repaired, and the seller tells us that the car has “clean floors.” Southern California’s lack of salt on the roads may have ended up a plus, but the salt air didn’t help the body any. The biggest problem you will have is that you will soon be upside down financially on a six cylinder coupe in today’s market. 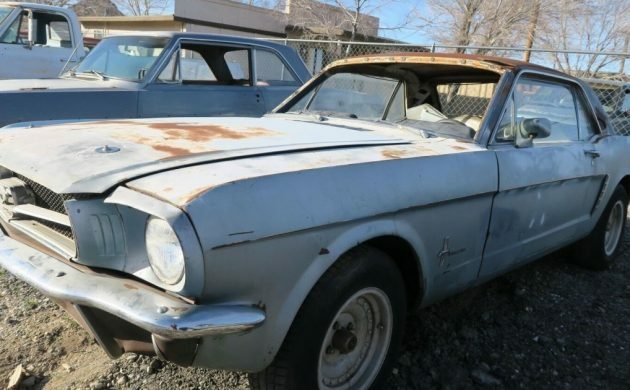 Craigslist and Facebook Marketplace are flooded with early Mustangs that are in equal or better condition for around the same price. Many of these are abandoned restorations that come with extra new and used parts. 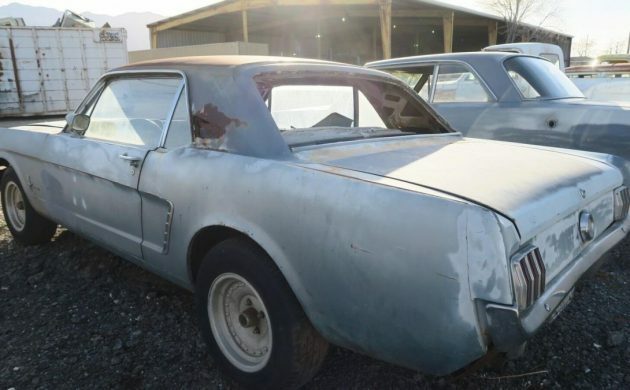 For somewhat more, you can buy a Mustang of this vintage that you can drive home immediately. The difference in price likely wouldn’t cover half the costs of a restoration. Is this Mustang worth the asking price? Does the fact that it is a Southern California car matter? Let us know what you think. Lucerne Valley is in the Mojave Desert in San Bernardino county, east of Victorville. There is no salt in California’s air except directly along the coast and that’s why California cars are coveted. Given that this car has sat out in the weather with only primer on it, it looks pretty remarkable. This same car back East would be a memory by now. This California car has possibilities for the right person even being a 6 cylinder but the price is quite high for the condition. The dash is really cut up and the roof work is daunting, perhaps this is best as a parts car donor. That dealer has over twenty (20) Mustangs for sale. “California’s golden days are over”…not by a long shot, bub! Geez, stick with car descriptions and stay away from pithy comments with zero merit. Now, regarding this Mustang. Like you said, with knowledge this time, far better examples can be found for the same price. Without getting political, you have to agree that things in Cali aren’t as they were when this Mustang rolled off the line. But try to find somewhere where they are. Southern Cali was also the center of the nascent space program in the 1960s. Many of the engineers and technicians were behind the rise of the car culture at the time. Even the entertainment industry got into the act…Agnes Carpenter, mother of Karen and Richard, worked at the plant that built the Apollo spacecraft. According to Richard, who has his car collection posted online, their family car was a 1968 Road Runner, bought new, with the 383 as Richard wryly observed that they couldn’t afford the Hemi. That didn’t stop Karen from imitating the little old lady from Pasadena, though. Just and FYI, Mustangs were only build in California at the San Jose assembly plant represented by the R in the vin, My dad worked there 56-83. LA was big cars if i remember correctly, Galaxies and the like. Car looks like it has been around a bit. Hmm where to start. rotten roof, Primer covering whatever other sins that are there. Heck, the guy didn’t even take the masking tape off the doors. You would need to check the cowl plenum and underbelly . Plus whatever damage was done by the glass being out. Bring a magnet. Anything is fixable. Good luck to the new owner.